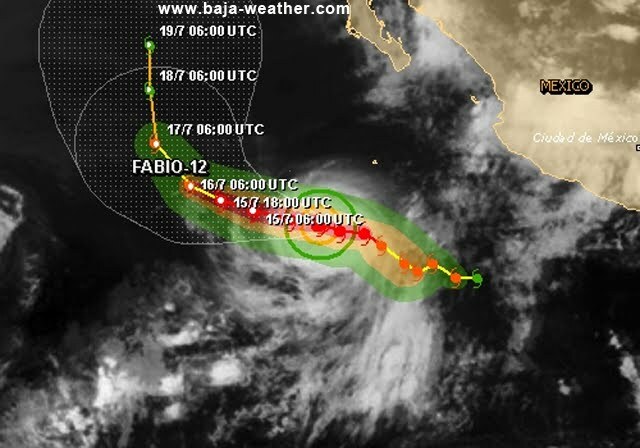 Forecasters say Hurricane Fabio will likely strengthen before weakening as it moves through the Pacific but that it won't threaten land.The National Weather Service in Miami says Fabio has maximum sustained winds of 90 mph (145 kph) and is about 530 miles (853 kilometers) southwest of the southern tip of Mexico's Baja California. It is moving west-northwest at 10 mph (16 kph) and is expected to stay on this course. Fabio is still a Category 1 hurricane and is the season's fifth hurricane. Some additional strengthening is expected over the next day or so before it starts to weaken. Meanwhile, Tropical Storm Emilia, farther out in the Pacific, is moving westward and is expected to become a remnant on Sunday.Once a hurricane, Emilia now has maximum sustained winds of 50 mph (80 kph) and is 1405 miles (2260 kilometers) west-southwest of the southern tip of Mexico's Baja California. It is moving west at 15 mph (24 kph).